The new Target Field Station – previously known as The Interchange – serves as a central multi-modal transportation hub and community gathering space in downtown Minneapolis. The station itself is a feat of modern transit design – delivering on the promise made by city officials to build a world-class urban transit center in the middle of one of the most livable cities in America. However, one of its more notable elements is invisible to the thousands of people using the station every day. The project features the first-ever, year-round snowmelt and stormwater runoff capture and reuse system in Minnesota. The year-round runoff capture and reuse system at Target Field Station is made possible by an innovative snowmelt system. After a snowfall, accumulated snow is melted by miles of glycol-filled tubing that is distributed beneath and throughout the station’s pavements and plazas. The glycol is heated by waste-heat created by the Hennepin Energy Recovery Center (HERC), a nearby waste-to-energy facility that burns municipal waste to generate energy. The glycol is circulated and recirculated through the system continuously. After melting the snow, the glycol is taken back to the HERC facility, heated, and then sent back out through the snowmelt tubing. In addition to making year-round stormwater reuse possible, the system significantly minimizes the need to use costly salts to melt snow accumulations. Thirty miles of glycol-filled snowmelt tubing run beneath the pavements and plazas. The glycol is cycled through the nearby HERC facility. The preconstruction photo above shows tubing before concrete is poured, with HERC facility at right. 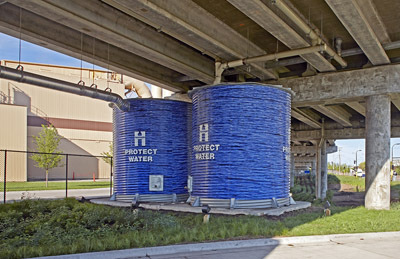 With the stormwater management system, runoff – whether from snowmelt or stormwater – is collected in cisterns and then pumped back to the HERC facility where it is treated and used in a variety of industrial processes, thereby reducing the facility’s dependence on the municipal water supply. In total, the stormwater system will direct approximately 1 million gallons of stormwater runoff per year toward the HERC facility for reuse. 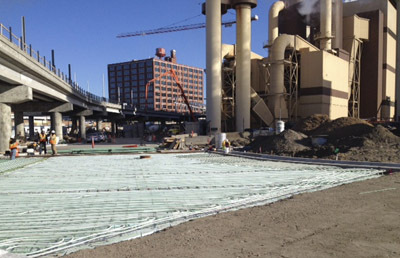 Implementing the reuse system along with several other stormwater management practices – including low-impact development practices such as tree trenches, greens roofs and bio-retention – reduces the amount of runoff from the Target Field Station site by 27 percent (compared to its previous use), reduces the total suspended solids in the runoff by 97 percent, and increases total phosphorous removal by 62 percent. Funded in part by a grant from the Mississippi Watershed Management Organization (MWMO), the stormwater management system design not only meets but exceeds City of Minneapolis’ stormwater requirements. The project did, however, encounter its share of challenges, including limited space with competing uses and poor soil conditions. Year-round runoff – whether from snowmelt or stormwater – is collected in cisterns (pictured above) from upper level plazas, roofs, and LRT bridge. The cisterns provide 40,000 gallons of potential run off storage. Because the project took place in a highly urban setting, every single square inch of the project had to be maximized, with many features often serving multiple purposes. Target Field Station was to be built on a parcel owned by Hennepin County – a parcel that previously contained the Hennepin County Environmental Services Building, surface lots, and light rail transit (LRT) storage tracks. The parcel also included the HERC facility and administration buildings. Project construction at Target Field Station could not disrupt HERC operations, which relied on daily deliveries from 200 garbage trucks. To avoid interrupting HERC deliveries, the project team realigned city streets and installed signalized intersections to create additional development parcels on site. The second major challenge was the site’s poor soil quality. The soil conditions required all structures be built on pilings. Additionally, the soils contained significant contamination. The contamination eliminated the ability to infiltrate stormwater onsite to prevent mobilizing the area’s existing contamination plumes to the Mississippi River, which is located downstream about one mile away. This provided a number of additional challenges in meeting City of Minneapolis’ stormwater management requirements and the requirements set forth in the project RFP. 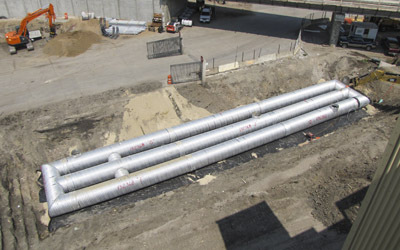 Underground stormwater storage system: 7,000 cubic feet of storage in 60-inch diameter CMP. As with any project of this scale, success required close collaboration through all phases of the project. Target Field Station was no exception. The level of stormwater innovation on this project would not have been possible without early relationships developed by the Interchange Project Office (IPO) among key project partners, which include HERC/Covanta for being willing to take on storm water reuse, MWMO for providing the grant dollars to incentivize the stormwater reuse, and the City of Minneapolis for revising their standard review process that allowed the design-build process to happen and for supporting the proposed stormwater management and reuse system. The two-year project began in July 2012 and was completed in April 2014 under an accelerated timeframe. With its teaming collaborators – which include project lead Knutson Construction, architect Perkins Eastman, and SEH engineers and landscape architects – the Target Field Station project exemplifies the level of stormwater innovation that can be achieved if all partners and reviewing agencies are engaged throughout the planning and design process. The project – featuring a stormwater first in Minnesota – creates a new civic identity and instills pride in the city for its mix of uses, location, and purposeful design.